Applies to: Office 365 Enterprise E5, Office 365 A5, Office 365 Nonprofit E5, and MyAnalytics add-on, Microsoft 365 E3, Microsoft 365 Business, Office 365 E3, Office 365 E1, Business Premium, Business Essentials. 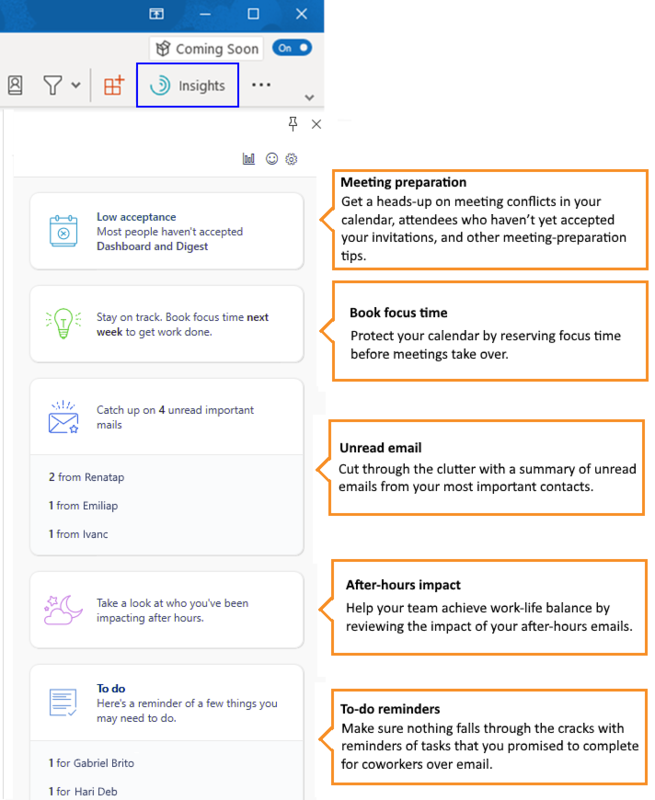 Please note: For Microsoft 365 E3, Microsoft 365 Business, Office 365 E3, Office 365 E1, Business Premium, and Business Essentials, this feature will be rolled out beginning in May, 2019. In Outlook, open the add-in by selecting the Insights (swirl) icon in the Outlook Home ribbon. If you are using the Outlook Web App, first open an email message, and then select the Insights icon in the top-right corner of your email message. After you send an email message, it takes up to fifteen minutes before Insights can inform you about it. Insights groups similar information into a single summary card that you can select and expand to see a more detailed view. Insights does not display read information about every email that you send. Please note the following circumstances. Read statistics are shown only for qualifying messages. A qualifying message is an email message that is sent to five or more qualifying recipients. A qualifying recipient is a person who is in the same company as the sender and has not opted out of Insights. Email in which the individual recipient count on each of the To: and Cc: lines is less than 5 AND the Bcc: individual recipient count is also less than 5. When you send email that has recipients on the Bcc: line, the precision of the email-read statistics is lowered. In your Sent Items folder in Outlook, select the email message. To see more information about this message, select the card. 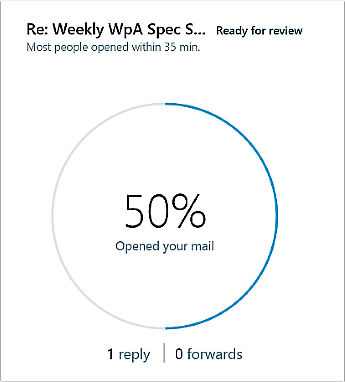 For the selected message, a chart shows the percentage of recipients who opened the email, and the number of times people replied to it and forwarded it. Based on the length of the message, Insights estimates how long a person needs to read it. It uses that number to decide whether people glanced, skimmed, or read the email, and informs you of this in a card. Depending on how many people opened the email and how long they spent reading it, Insights might suggest that you follow up on your email, or it might show tips to help improve email communication. You can turn off the add-in by opting out of MyAnalytics. See Can I opt out of MyAnalytics? for how-to steps.